Were you injured at Aventura Hospital? If so, our Aventura personal injury lawyers can assist you. Were you hurt in a car accident and went to Aventura Hospital Emergency Room for treatment? Our Aventura car accident attorneys can help. Were you injured as the result of a slip and fall and ended up at Aventura Hospital because of those injuries? The Aventura slip and fall lawyers at the Wolfson Law Firm are ready, willing and able to represent you. All you have to do is call us toll free at (855) 982-2067 or at (305) 285-1115. All consultations are free of charge and we never charge a fee unless and until we make a financial recovery for you. 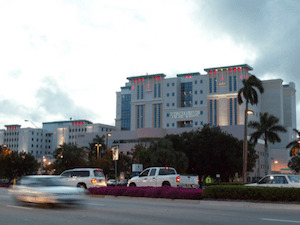 Originally known as Golden Isles Hospital, Aventura Hospital was founded in 1965. It was renamed in 1993 after being relocated from Hallandale Beach to its present location in 1974. Aventura Hospital invested $130 million in its facility. As a result, the hospital opened a new North Patient Tower with 243 private rooms. It also upgraded its Emergency Room to 28 beds; two new ICUs; and added 10 operating rooms to the Aventura Hospital Surgical Services Suite. If you end up in the Aventura Emergency Room after an accident and you need to consult with an Aventura personal injury lawyer, you can reach our Aventura Hospital accident lawyers any time at our toll-free number (855) 982-2067 or at (305) 285-1115. We can answer all of your questions about your legal rights following any type of incident or accident. We can also see you by appointment at our Fort Lauderdale offices at 101 NE 3d Avenue, #1500, Fort Lauderdale FL 33301 or in our Miami office at 3399 SW 3dc Avenue, Miami, FL 33145. Our Aventura accident lawyers can also come to you. All you need to do is to call us right now. The Aventura personal injury lawyers at the Wolfson Law Firm provide complete legal representation in all wrongful death and personal injury claims or lawsuits. We will represent you professionally and relentlessly so that you can achieve the justice and compensation that you ultimately deserve. Never be a silent victim when you are injured because of the negligence or intentional actions of another person or corporation. Call us today for your free consultation at toll-free number (855) 982-2067 or at (305) 285-1115. You owe it to yourself and your family to get the help that you need.